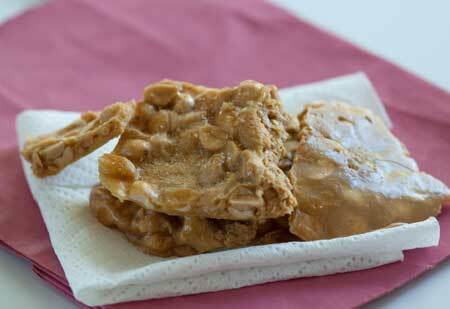 A peanut brittle with a texture a little softer than a Butterfinger candy bar. For best results, weigh out your peanut butter and use a thick, nonstick saucepan. Line a large rimmed baking sheet with non-stick foil or parchment paper. Dissolve baking soda in water and set next to the stove. In a microwave-safe bowl or Pyrex measuring cup, heat the peanut butter for 30 seconds or until it is soft and warm. Add the vanilla to the peanut butter. Combine the 2 tablespoons water, sugar and corn syrup in a large, heavy, nonstick saucepan. Cook over medium-high heat until a candy thermometer reads 275F. Lower heat slightly, add butter and and peanuts and stir constantly over medium until candy thermometer reads 300 degrees. Remove from heat. Quickly stir in baking soda mixture and softened peanut butter mixture. Pour candy onto prepared cookie sheet and spread as thinly as you can. If you have trouble spreading it, grab a second sheet of parchment paper or non-stick foil and press it down slightly. It should be no more than 1/2 inch thick, but preferably thinner. Sprinkle the finely chopped nuts over the top if desired. To get the right level of sweetness, it's best to use mainstream peanut butter. I've made this with natural style and while it's okay, it's not quite as sturdy and definitely not as sweet. The chopped peanuts are to make the candy look a little nicer. Some batches are prettier than others. Also, the recipe calls for Spanish peanuts, but I can never find those and have had success with dry roasted peanuts.